This question is along a similar vein to Nasim's question about the Hever portrait of Anne Boleyn. I read that the Hever portrait by Holbein, supposedly of Mary Boleyn, was until the 17th century labeled as Anne, and then changed to Mary. Does anyone know the history of this. It has always seemed a bit odd to me that Mary Boleyn would have been painted by Holbein. He first came to England in 1526, I believe, when Henry's affair with Mary Boleyn was cooled and he was starting his hot pursuit of her sister Anne. Mary was in disgrace with her family by the end of 1534, when she married in secret William Stafford. He was in England from 1526-1528, and then went to Basel, and did not come back to England until 1532. The timeframe seems tight. 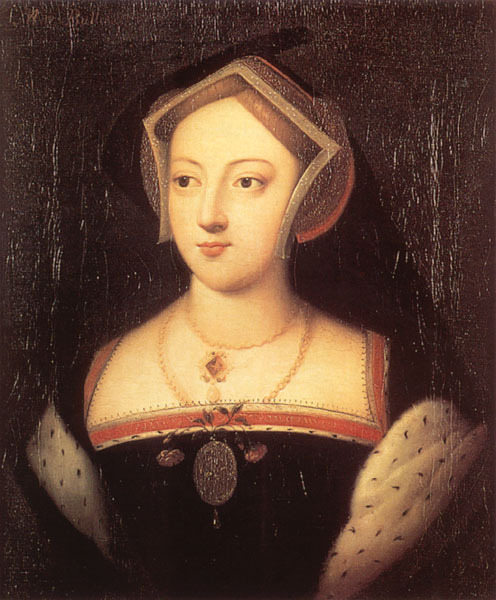 From 1526-1528, Mary Boleyn was the former mistress of the King, from 1532 to the early part of 1533, the sister of the King's current mistress, soon to be wife. The only really logical time for her to be painted was from the spring of 1533 to the autumn of 1534, when she fell into disfavor. Annd did at times seemingly wear the gable hood pictures--at least one account of her execution states she was wearing a gable hood to the scaffold. So could this portrait be of Anne and have been relabeled? That's a thought I've had about the painting too. It matches a sketch also often tied to Anne. It just seems odd that she would have a portrait taken of her. Maybe as Henry's mistress, but then again as far as I know Bessie Blount never had one done, and she even had a son by Henry. And she may have been the sister of the Queen, but George was the brother of a queen, besides having a title of his own, and he didn't get a portrait done either, right? Sorry to be ignorant but which portrait is this? Is it the one with her wearing Ermine or a sketch? It's worth noting that not a single definite portrait of Anne exisits from her lifetime, only a coronation medal which has her in the English gable hood. The rest are all definitely later and infact, the very famous image of her which everyone knows was for several hundred years identified as Mary Tudor, Henry's sister. Most of the "portraits" of Anne and Mary are Stuart at the earliest. I'm interested in the Boleyns and Hever castle. I have reservations about this picture. There's no good documentation that it is Mary Boleyn in the first place. Who knows - it could be her, or it's an invented likeness. Or it was someone else mislabelled as Mary. The art historian Roland Hui delivered a paper on Anne Boleyn's portraiture, in which he argued that the Horenbolte/Horenbout portrait allegedly of Anne was actually Mary Boleyn. Mary's husband, Sir William Carey, was a noted patron of the arts and one of Horenbout's earliest English patrons. There is a portrait of William, by Horenbout, and so it's entirely probable that a companion piece of Mary would have been painted at around the same time (c. 1526), making the age of the sitter tally with what we know of Mary's date of birth. However, on the subject of the Hever portrait of Mary Boleyn it probably dates from the 18th century, if not later. There's no firm documentation before then linking it to her, or Queen Anne, and the style of painting is far more similar of the 18th century than the 16th. Sorry, I should perhaps have provided links to the portraits I was talking about.